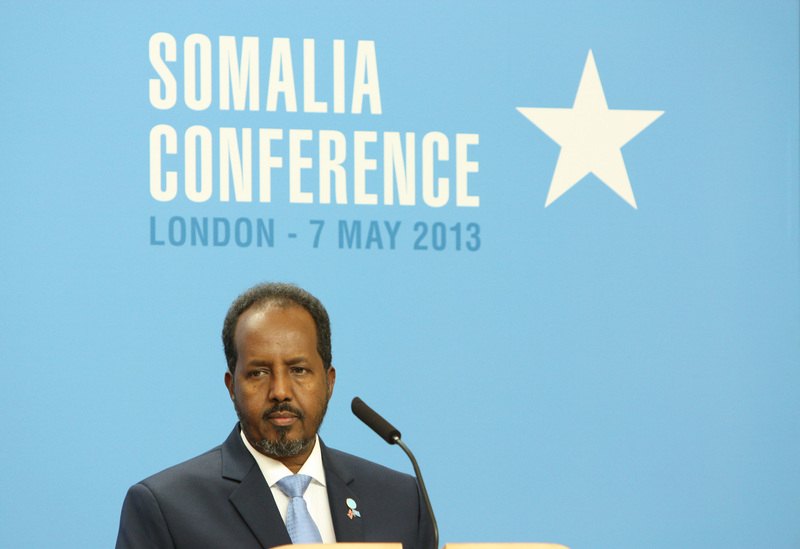 Somali President Hasan Sheikh speaks at the Somalia Conference in London last year. Two years have passed since Hassan Sheikh Mohamud was elected the President of the Federal Republic of Somalia. He came in to office with a view that federalism in the country needed more debate. The federalism debate revolves around two main pillars: the sharing of political power with the federal government and the sharing of national resources among “˜Federal Member States’. It is the resources part of the equation that is now getting more traction. The Federal Government of Somalia has already warned the regional administrations of Puntland and Somaliland about the exploration deals they have struck with oil companies. Somaliland views itself as an independent country not affected by decisions made in Mogadishu, whereas Puntland considers itself to be part of Somalia but argues that resource-sharing agreements among federal member states have not been finalised. Successive Puntland administrations have argued that the regional administration is entitled to sign agreements with oil companies, and cites the Provisional Constitution. The Provisional Constitution adopted on 2nd August 2012 does not give Puntland or any other regional administration the right to enter into oil exploration agreements with foreign companies. It does however, require the Somali Federal Government to consult member states on resource allocation. The current territorial dispute between Somaliland and Puntland is partly about acquiring or retaining the privilege to sign agreements with foreign oil companies. The resource element of the conflict has been brought to light in a report the Heritage Institute for Policy Studies has published recently. When the Provisional Constitution was being adopted in Mogadishu there was a widespread belief among “˜stakeholders’ that, although the new Somali government would no longer be a transitional one, it woulld not have the right to usurp the privilege of existing regional administrations to enter into agreements with oil prospecting, foreign companies. This argument allayed Puntland’s and to some extent Somaliland’s fears that the new government in Mogadishu would not allow Garowe and Hargeisa to make deals without approval or consultation with Mogadishu. Since September 2012 the Somali Federal Government has signed two major agreements with Soma Oil and Gas and Somalia-Fishguard. In the past, regional administrations awarded fishing licenses to foreign companies. The number of foreign fishing vessels in Somali seas is not known. The agreement between the Somali government and Somalia-Fishguard will affect existing contractual relationships between foreign fishing companies and regional administrations. Neither Puntland nor Somaliland has the domestic or international legal recourse to challenge decisions the Somali Federal Government makes about natural resources. And no future Somali government will be able to revoke major agreements between the federal government and foreign companies. This legal and political reality in Somalia constrains the ability of regional administrations to behave as independent entities capable of signing agreements without the input of the federal government. There is little the Somali government can do about how regional administrations go about their business domestically but its authority, codified in the Provisional Constitution and empowered through post-transition institutions, give the federal government a major say in the management of natural resources in Somalia. Many people in areas affected by resource-related conflicts in Somalia believe that only a national government can avert war between regional administrations over natural resources. The belief that those with an unparalleled access to resources and political power will fare well in new Somalia cannot be wished away. Both unchecked political power at the federal government level and the absence of transparent political institutions at federal member states level delay the process of recovering from two decades of statelessness in Somalia. The Somali political elite need to choose between protecting clan interests or protecting the national interest. The language of political conflict needs to be replaced with the language of political accommodation and human rights because Somalis are not in disagreement with each other over abstract ideas but over concrete, resource and governance-related ones. A change in outlook begins when each group strives to understand the perspective of the other. The outlook of the “˜pro-strong government’ group has been shaped by 15-year reign of warlords in many parts of Somalia, whereas the outlook of the “˜pro-weak government’ group has taken root in response to, among other issues, unequal resource distribution by the last pre-1991 central government of Somalia. The group of Somalis whom those two politically dominant groups have lumped into minority status (aka “˜the others’) for not belonging to an armed clan, have a different perspective which is worth exploring and understanding. This group can also make a meaningful contribution to the debate about governance and sharing of resources in Somalia. The sooner this group is allowed to join the debate the better for Somalia. Liban Ahmad is a writer based in the United Kingdom. The Somalia FG first needs to control its own territory before it tries to tell Puntland and Somaliland what to do with theirs. Potentially one the of the richest oil and gas regions is just 50 kilometers outside Mogadishu in the Lower Shebelle region. But the FG cannot even exert control there. The answer for Somalia is to get rid of the useless and weak FG and partition the country, unfortunately the African Union, EU, and UN will try to preserve the status quo even if that means another 20 years of misery for the Somalian people.